This is, functionally, a 2019 CAT 8 BBCOR bat. It runs the same long aluminum barrel and anti-vibration knob. It is, when all is said and done, a fantastic bat with a balanced swing. We aren’t the only ones to have information about the Alex Rodriguez. Other places, in particular those who sell bats, usually have a boiler plate write up on the specs of a bat. Many of those we reference to make sure we are seeing what we should be. Here are some more references for the 2019 Marucci Alex Rodriguez review. We have the same recommendations here as we do with the Marucci CAT 8 in BBCOR. Expect a stiffer swing, big barrel, loud sound and a slightly end-loaded bat compared to others on the market. Those who love the CAT 8 are huge fans and Marucci doesn’t disappoint with this limited edition colorway. The most comparable bat, because it is the same thing, is the Marucci CAT 8. However, in the BBCOR space, the most applicable bat is Marucci’s Buster Posey ProMetal bat. That, too, is a CAT 8 with a unique and limited colorway. 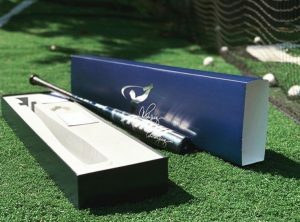 “Commemorating Alex Rodriguez’s 696 career home runs, this individually numbered bat is one of only 696 produced in the A-Rod GS25 Limited Edition collection. The bat’s navy and silver color pattern pays homage to Rodriguez’s 12 seasons in new York and incorporates 25 silver pinstripes on the barrel to mark each of his 25 career grand slams. This limited edition A-Rod GS25 represents my love of the game, my spirit of competition and my determination to give my best. It means a lot to me to share all of this with you. I hope you will feel the same passion and excitement I have had for baseball for as long as I can remember. I wanted to design a bat with explosive performance that unleashes each player’s abilities at the plate. With the help of the team at Marucci, we carefully crafted the GS25 to my exact specifications with a thin handle, large barrel and balanced feel to maximize bat speed and home run potential. We limited production to 696, so that each bat represents a home run in my career. Whether you plan to use the GS25 in a game or hang it on your wall as a souvenir, you’re one of only 696 people in the world to own this bat. I am sure it will bring you good luck in your baseball career and beyond. This bat is the exact same as the Marucci CAT 8. But, of course, with a limited edition colorway. This is only a BBCOR version bat with limited sizing and lengths.